the One to Go For it. 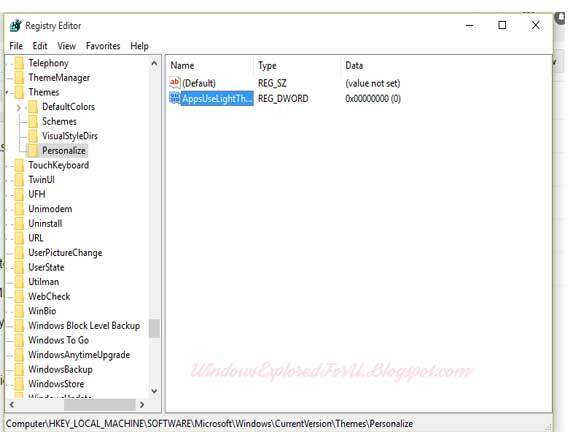 Its Simple,All You Need to do is Edit the Central Part of Windows Which Is Registry. But People Says its Dangerous Editing Registry,is it True or Not ?? Editing Will Lead to System OS being Corrupted. How Can I Edit ??? You Need to follow the Upcoming Steps As it is in Your PC,My Friend. Step 1 : Login to your PC as Admin. Step 2 : Press Windows + R.
Step 4 : A New Window Will Open,Navigate to Following Key. Step 5 : Right Click On Themes,New->Key,Name it as Personalize. theme,Simply Change the Value to 0,or delete the registry key,you Created Above. Logesh August 25, 2015 Let me Share my thoughts!